Boys Basketball: What’s to come? 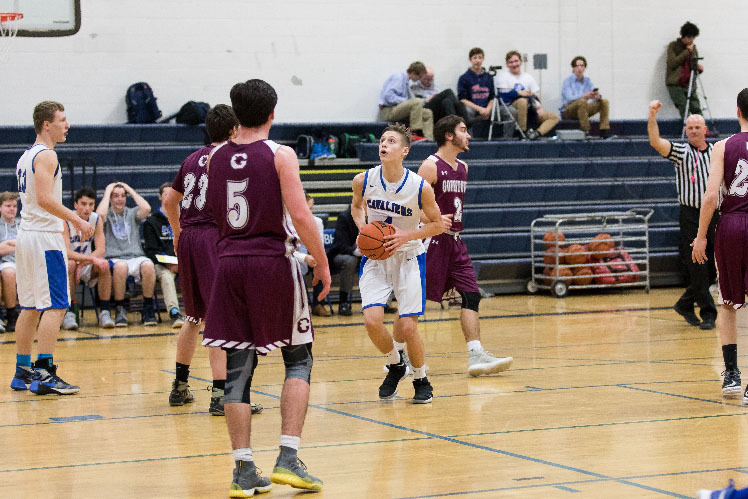 Pictured is Grant Snyder '20 playing last season vs. Goffstown. The team, this year, hopes to do just as well. “We will have a lot of speed this year. Don't sleep on us,” said Snyder. The 2017-2018 Boys Varsity Basketball team was the one to beat in the NHIAA Division II tournament. The boys finished their regular season in first place with a 19-2 record, and they were granted a bye week in the first round of the tournament. They defeated Milford, Merrimack Valley and Oyster River to follow, winning the school it’s fourth boys basketball title in history. Potential advantages for the 2018-2019 varsity team are the height of the lineup. 6’3” point guard, Grant Snyder ‘20, and 6’2” forward, Dhruv Miglani ‘19, influenced the championship run of last year. They both contributed to their team in games and are going to be crucial this winter. “My role on this team is definitely being a leader. As captain, it’s my responsibility, along with Grant’s, to make sure the new players do the right thing and have the right mindset,” said Miglani. Their leadership as captains for the upcoming season will hopefully be what allows the new squad to win games. Losing eight seniors from last season, including four starters that contributed a substantial amount to the Division II title, means that the younger players will have to step up as winter approaches. The roster is fit for around twelve men and there could be up to 40 players at tryouts, each fighting for a spot on the team. “Preseason has indicated that we are a young team and will need to rebuild on the fly. Only four of us are returning from varsity last year, and a total of three seniors will be on the team this year. We’ll need to build chemistry to be successful and a lot of leadership will be needed,” said Miglani. Although there is both a JVB and JVA team along with Varsity, every spot is open for competition. In recent weeks, the boys have been attending what is called “Open Gym” where the players are allowed to shoot around, do some drills and scrimmage, all before tryouts arrive on November 26. “Open gym in the last few weeks has been packed with about 20-30 kids showing up…There has definitely been both hustle and talent in open gyms and a lot of the younger guys want a spot on the team and have really been showing out in the practices,” said Miglani. Even though last year’s season was historic for the school, this season has the potential to be just as monumental. Looking at this season and having a small preview from open gym, it’s clear that there is talent in the program. “Our offensive weapons this year will be driving to the basket and our defensive weapons will be rebounds and aggressiveness,” said Snyder. These skills will be important to work on this season if the boys hope to have a successful season and a chance to repeat last year’s championship win. 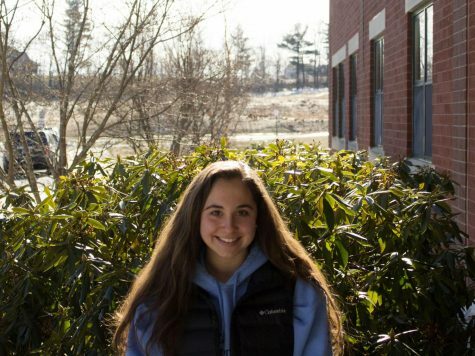 Losing eight key players can be worrisome for the current athletes and coaches; however, using the momentum and mindset from last winter could be the token of success. “The mindset last year was to out rebound every team and take it one game at a time. Staying focused on the positive aspects of our game and learning from our negative aspects will help bring that back this year… it was a fun experience last year and I learned a lot from our team chemistry. We just have to bring that back this year,” said Snyder. The team has their first home game on Tuesday, December 18 at 6:30pm against Manchester West.